Around May and June I become a little obsessive with my garden. Over the years, it has grown from 4 tomato plants to now 19 beds, 9 heirloom apple trees complete with their own birth announcement, 2 peach trees, 7 blueberry bushes, and 2 grape vines. Okay. This did not happen in one year, but over the years, I have expanded the garden like you would expand a family. Sometimes I think I am Eddie Albert from Green Acres. Remember that show with Eva Garbo? Just like Eddie Albert’s character, I am a lawyer turned gentlewoman farmer. This year was a leap year. Although my apple trees are little, I thought I could protect them from the deer by surrounding them with four foot deer fencing. Apple buds are quite enticing and they outsmarted me by nipping at the buds through the fencing. They must have push the fencing with their noses. One particular apple tree did not bloom at all this year and I hope that it is not dead. My apple trees are like my babies. Haven’t you heard the saying don’t get between a mama bear and her cubs. Well I feel the same way about my apple trees. I had no other alternative but to put up an 8 foot wire, ugly fence to keep the deer out. I knew they would never prosper if the deer could nip at them. So, up went the fence. So, You Say You Want a Corn Field? Two years ago I grew 5 stalks of corn. It makes the most beautiful sound as it sway back in forth in the wind. My only mistake was not realizing that a stalk only makes one large corn. My gardening neighbor came to visit my garden one day and saw my corn. She looked at me and said, “Anna, you have only five stalks with 6 members in your family. Didn’t you realize that corn only makes one large corn?” Boy, did I feel stupid. What was I thinking. Corn is not a tomato plant. 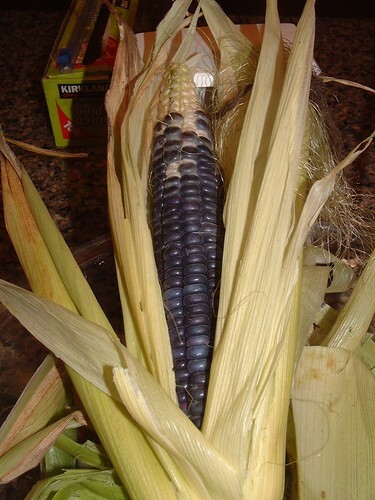 To top it all off, I grew blue Hopi corn since I wanted “blue” corn. I could not figure out what why the corn did not taste good. In searching the internet, I found a site that explained that blue Hopi corn is for cornmeal. Another dumb gardening mistake. This is how you learn, I have been told. Back to the corn. So here was this large plot for my taking. Sunny, near a fence so not as much wind as my other garden, AND just a little perfect piece of Eden. So, I thought. Try digging into virgin meadow soil with field grass. I will hand you the pain killers… It is near impossible. In the past, my husband had “pick axed” the grass to create the beds but this is really hard work. (I can do about 2 feet and I am done for the day.) Instead, we rented a sod cutter. I would highly recommend using one if you need to cut sod. It cost us $90 for the day and it cuts the grass like a carpet. My husband found it easy to use and cut the sod easily. When you take a pick axe to the ground, it just tears up the grass and you end up losing a lot of soil. With a sod cutter, you lose a minimal amount of soil and you simply roll up the grass like a carpet. Be warn. It is heavy lifting the old sod into a wheel barrel. It is great sod to put somewhere else in the garden. In my case, the “grass” was mere junk. Full of weeds and field grass. How Did a Corn Field Become a Larger Garden? My husband got a little carried away when he was cutting the sod and created a much larger garden than I wanted. I was scratching my head wondering what I was going to grow in the other beds. Again, we tried digging into the dirt. No go. It was hard as a rock. Back to the rental shop. This time we rented a heavy duty tiller which according to my husband, is back-aching hard work. This machine is too heavy for me to maneuver. You can not use your garden variety Mantis tiller for this job. I tried and the wheels just spun. Finally all the beds were tilled and my hard work had just begun. 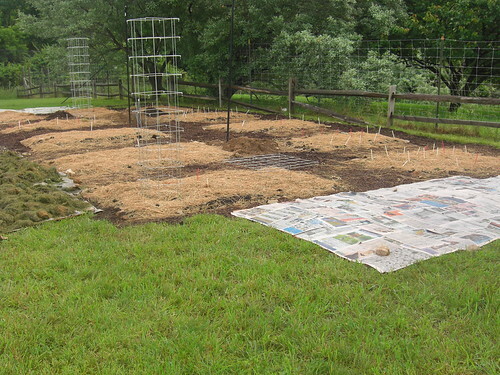 After I was done laying out all the four by 8 beds, I wish I had created raised beds. It is so much easier. It took days to lay all 11 beds with 3 foot walkways and a four foot center aisle. I told you I was a little obsessive. I was out there every day with my measuring stick. Thank goodness my landscaper started to help me out and started bring the compost back in his machine. It would have taken me days to move that much compost in my wheel barrel. I also put down old newspaper in the aisle and put mulch on the top to suppress the weed. This is good for about 2 years and then I have to do it again. My other garden has thyme plants between the aisle as a living mulch. I am not sure I have the energy to plant the thyme in this garden since there are more beds. Who knows. Once you start digging, you start to eye other places to create beds. I hate the grass. It needs to be watered, cut, fertilized, etc. So, anytime, I can find a way to get rid of the grass, I do. As I indicated in my article about my gardening mishaps ( learn from my mistakes…) I moved all of my perennial herbs out of my raised beds. They became invasive and took over the bed. I am still taking out fennel which is everywhere and oregano, which seeded itself anywhere it touched soil. What did I need for all my herbs? Another bed! So, now I have an herb bed. Many times I create a bed in the garden and realize that I totally screw up. It’s too small. I planted the plants too close, or did not put the plants in the right location, etc. My husband hates this double work, which I am constantly doing. I had to take out all of the raspberry plants which thank goodness had not rooted, and move them to the center of the bed. (See picture above of my first planting of the raspberry canes.) Previously, they were too close to the front of the bed, Raspberry plants are invasive and will grow right out of the bed if I don’t watch them! So, tell me some of your gardening adventures? Hooray for you! I started my poor little garden this year, and already have lessons learned. Not enough sun, a gap that lets the chipmunks in my squash is turning yellow, and Im not talking about the fruit! I guess 20 or so days of constant rain is not helping either! Nice to hear other stories. Share some pictures of your labors… and I will too. Anastasia, the rain is killing my peppers and eggplant. The beans, tomatoes, chard, strawberries, and corn are doing well. We need the sun to dry everything up. I will post pics. Nice post. I want to learn how to make a garden for survival because I think we are facing an economic collapse so just in case that happens I want to know how to survive if the grocery stores become vacant. We have been gardening in SC for about 4 years now. It is a constant experiment! Some things we’ve really figured out like garlic, onions, kale, lettuce, eggplant, basil, etc. Our intense summer heat and poor soil create quite a challenge for backyard organic gardeners. We love compost and compost tea! Come check out our blog–southernorganicgardening.blogspot.com and see what we are doing! My favorite things grow in the Spring and Fall–lettuce and kale. Cherry tomatoes, eggplant, peppers, and basil are great in the heat of the summer. We have very sandy soil so we just have to keep everything watered. You have quite an array of fruits and veggies growing! Your funny stories will give me hope as I continue to make similar mistakes in the garden.